Whether you’re a trivia buff or you have a competitive side, trivia nights are the best way to spend time with friends and family while sharpening your knowledge of random facts. And a bonus? Bars hosting trivia night usually have some stellar happy hour deals to accompany the night. Here are a few of the best trivia nights in Wisconsin! Head down to the Back 40 to enjoy some drink specials and nightly specials while playing trivia. For Wednesday trivia, specialty beers are $2.50 per bottle only and ribs and wings are the nightly deal. If you couldn’t make it there for trivia night, never fear, Sunday is Bar Bingo. Jack’s American Pub attracts a down-to-earth crowd. Gather for trivia night and grab dinner while you’re there. Order a round of drinks before the games begin so everyone’s brains are loosened a bit (it’s easier to invent answers that way). Jack’s may just be your new weekly hangout. While Mr. Brew’s does have a few different locations, the Monona location feels like it’s the only one that matters. Order the Pub Grub or fried pickles to start trivia off right. Scratch that, go with the pretzels & beer cheese—that’s brain food right there. Order a beer flight and sample hoppy goodness all while answering miscellaneous trivia questions. Babe’s was established in 1988 and on its website claims it’s one of Madison’s first sports bars. Come for the atmosphere and ambiance, stay for the trivia. Plank Road, as do most pubs, offers nightly specials. Enjoy $1 off Malibu mixers, that should jumpstart your brain. Bone up on some miscellaneous facts and figures, so you don’t end up in last place during trivia night. But hey, if you do, you’re still a winner because of all the fun—and the drink specials. The Red Zone offers classic bar food that satisfies a fried-food craving. Order a round of appetizers for the team and a pitcher of beer to get trivia started. With nine big-screen TVs, seven beers on tap, 32 burger, sandwich and wrap combinations, and 28 appetizer choices, according to its website, the Red Zone is the place to be for trivia night. Howie’s can be perfect for a couple’s night out, an after-work meeting, a family get-together or a few friends looking to have some fun. With an upstairs seating area as well as bar seating and booths downstairs, it’s easy to hear the trivia host and it’s fun to be a part of trivia night. Stay tuned to Howie’s social media because they often host themed trivia nights. Self-dubbed the “Irish pub with a rock ‘n’ roll attitude,” according to its website, McAuliffe’s hosts many events all week. Whether it’s Nerd Nights, karaoke or trivia, everyone is usually having a blast at McAuliffe’s. It is an Irish bar though, so beware—they may try and make you drink whiskey. Well since you are going there for trivia, might as well download Paulie’s smartphone application and receive a free beer for doing so. That way you can check out when trivia night is hosted as well as any nightly drink or food specials that may be happening. Trivia is usually hosted right after happy hour—a dangerous (and amazing) combination. The Tap House 138 is actually housed in the Viroqua American Legion. 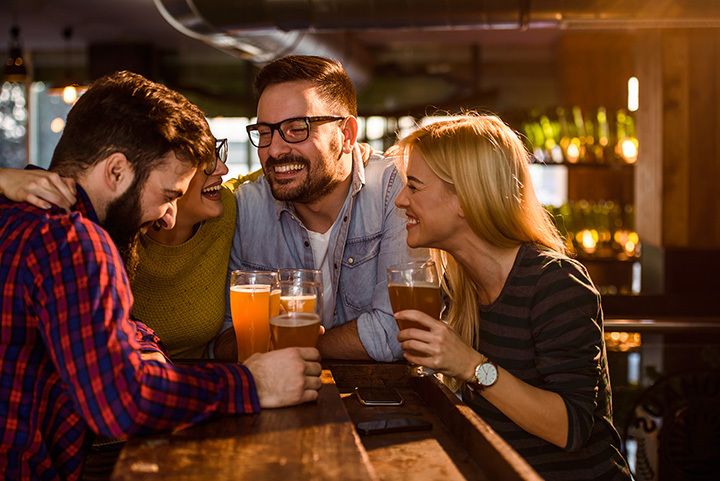 A perfect place to relax and visit with the neighborhood regulars, the Tap House offers affordable prices so the whole family can attend trivia night. Maybe invite some friends too, create two separate teams and see who can answer the most questions correct.